The following is the text of my talk at Tbilisi State University on 30 November 2018. I’d like us all to imagine that it is 100 years ago today, the 30th of November 1918. The Russians have begun their second year under Bolshevik rule. They have held celebrations to mark the occasion a few weeks ago. In Georgia, the country has been independent now for a little more than six months. Less than three weeks ago, the First World War ended – and with it, the German presence in the country. The British have arrived in Tbilisi. The very first they do is insult the Georgian president, Noe Zhordania. They later apologise. It is not a good start to the Georgian-British relationship, but this will eventually be fixed. In my presentation to you today, I want to compare four areas which highlight the differences between the two societies that have been created in the two countries, Bolshevik Russia and Menshevik Georgia. And I want to do this by looking at both of those societies as they stood exactly one hundred years ago today. • and foreign and defence policy. In Russia, all opposition parties have been crushed, even the socialist ones – and free press has been suppressed. This began a year earlier; the first Menshevik newspapers were closed down by the state in 1917, only weeks after the Bolshevik coup. This was followed by the dispersal of the Constituent Assembly in January 1918. That Assembly was the only truly democratically elected parliament Russia had ever had, or ever would have. The alliance between the Bolsheviks and a section of the Social Revolutionary Party (the Left SRs), the only legal non-Bolshevik party, came to an end in July 1918 when the Left SRs revolted against Lenin’s regime. As a result, by November, 1918, just one year after seizing power, the Bolshevik Party is effectively the only legal party in Russia. Lenin has expressed contempt for “bourgeois democracy”. He claims that Soviet democracy, based on workers’ councils (soviets), is on a higher level. But already the Soviet themselves are being stripped of all power. And the Cheka, the forerunner of the GPU, the NKVD, the KGB and today’s FSB, has been in existence for a full year. Not a few months, not following on the beginning of the civil war, but an entire year. The Cheka is one of the first new institutions of the Soviet state. And one of the most ruthless. The GULAG has also begun to take shape. The first forced labour camps have been created. Opponents of the Bolshevik regime have been arrested, held hostage, tortured and executed in their thousands. And the regime is only one year old. Meanwhile in Georgia, a multi-party democracy has been created, with free elections coming up. The main Georgian political parties competing with the Social Democrats were the National Democrats, a bourgeois liberal party; the Social Federalists; and the Social Revolutionary Party. There are also the Georgian Bolsheviks, but I will come to them in a moment. In elections to be held in a few weeks’ time for the Constituent Assembly, which had the task of writing the new constitution for the Georgian Democratic Republic, the Social Democrats will win 81% of the votes, and 109 of the 130 seats. The Georgian Bolsheviks are the exception; committed to a violent overthrow of the democratically elected government of Georgia, they exclude themselves from the political process – and operate largely from the underground for the first two years of the republic’s existence – and then they emerge as a legal party, though they are never very strong. It is important to emphasise how different the Bolsheviks are from all other parties. They are indeed a “party of a new type” – a phrase attributed to Lenin – because they have no interest in competing with other political parties in free and fair elections. Their interest is the overthrow of the hated Menshevik regime. They make a couple of pathetic attempts to do so, which are easily crushed. Once above ground after May 1920, as a result of the Soviet Russian peace treaty with Georgia, they are part of the Soviet operation to eventually conquer Georgia. In other words, they fit the classic definition of a “fifth column”. Meanwhile, the Georgian Constituent Assembly is working steadily to draft what will be the most progressive constitution the world has ever known. The Georgian Social Democrats are carrying out in practice what Karl Kautsky would write: There is no socialism without democracy. In Russia this was the period of “war communism”, marked by war between the cities and the countryside, with mass starvation as peasants are forced at gunpoint to turn over food for the cities. Bolshevik hostility to the peasants is growing year on year, with a brief retreat during the period of Lenin’s New Economic Policy. By the end of the 1920s the Bolsheviks will unleash forced collectivisation which leads to genocide, particularly in Ukraine. Millions will die as the government tries to ram collectivised agriculture down the throats of the peasants. Forced collectivisation was always part of the Bolshevik plan, and Trotsky was an advocate of it before Stalin was. In Georgia, on the other hand, there has been the implementation of an ambitious, and largely successful, program to break up the large estates and distribute land to the landless peasants – with almost no resistance from the landowners, no war between city and countryside, and no famine. The result is the emergence for the first time of a middle class in the countryside. This was the intention of the Georgian Social Democrats all along because they learned from the experience of the western Georgian region of Guria around the time of there 1905 revolution, where revolutionary peasants overthrew tsarist rule and changed the relationship between rural workers and the Social Democratic Party. The Georgian Social Democrats were from then on allied with, and served as a voice for, the landless peasants, unlike the Bolsheviks who had little or no support in the countryside. The Georgian Social Democrats also had a theoretical basis for opposing state ownership of the farms. In their Marxist interpretation of Russia as an “Asiatic” society, they were convinced that state ownership of farmland provided the material basis not for socialism, but for despotism. Their greatest fear was that a socialist revolution in the Russian empire would fail, and be replaced not by liberal capitalism. Instead, they feared a revived, and far more powerful, autocratic regime – a renewed form of what they called “Oriental despotism”. Allowing peasants to own their own land removed that social basis for a despotic regime. In Russia, Trotsky will soon be making the case for the suppression of independent unions, not needed in a “workers state” – and calls for the militarisation of labour. He feels that what workers need, now that they achieved state power, is the strict military discipline that is leading the Red Army to victory in the Civil War. Even Stalin considers this proposal for the militarisation of labour to be a step too far, though once he is in power, he implements it. Trade unions in Russia have grown since the fall of the tsarist regime, but they are rapidly falling under the control of the Communist Party. Strikes are no longer tolerated, and union leaders are imposed by the ruling party, not elected by the workers. Soon those unions will be transformed into “transmission belts” to pass on instructions from the Communist Party leadership to the workers, and to encourage workers to work harder and be more productive. They are nothing like unions in the West, which were then – and now – the most effective means of self-defence for the working class. But then they join with the government and employers to create a Wages Board, an innovative tool to regulate wages and working conditions, and to ensure a minimum standard of living for the urban working class. They hardly ever strike after that – because they don’t need to. That Wages Board is decades ahead of its time, and it anticipates the rise in Western Europe after the second world war of a “social market economy” and social partnership. The local Bolsheviks make determined efforts to win influence in the small urban working class in Georgia, but they completely fail as the workers remain loyal to their social democratic leadership. In Russia, civil war rages from the summer of 1918, Germany occupies vast swathes of Russian territory, including all of Ukraine, follow the disastrous Brest-Litovsk peace agreement. Eventually Russia finds itself at war with nearly all the western powers, including France, Britain, the USA, as well as Japan. By 30 November 1918, the Whites are winning the civil war. Earlier this month, Admiral Kolchak seizes control of the White forces in Siberia, becoming a military dictator, and begins his march on Moscow. As a result, the Bolshevik regime is tottering. Bolshevik foreign policy consists of increasing isolation of the regime, constant warfare with foreign enemies, and overt attempts to bring Bolshevik regimes to power in neighbouring countries including Hungary, Finland, and Germany – with no success. In Georgia, there is no civil war. Georgia is forced to repel a brief attack from Armenia at the end of 1918, but the Turkish threat is now gone thanks to the German intervention. There is some unrest in Abkhazia and South Ossetia, mostly provoked by the Russians (nothing new here). The Russians themselves, White and Red alike, make aggressive moves toward Georgia, neither side accepting the right of the Georgians to self-determination. It is the one thing the Whites and the Reds agree on: they do not recognise the independence of Georgia or any other outlying province of the former empire. But Georgia is largely at peace until 1921 when the Russians invade. Georgia’s foreign policy is based on strict neutrality, especially with regards to the Russian Civil War – which makes no friends for Georgia among either the Whites or the Reds. 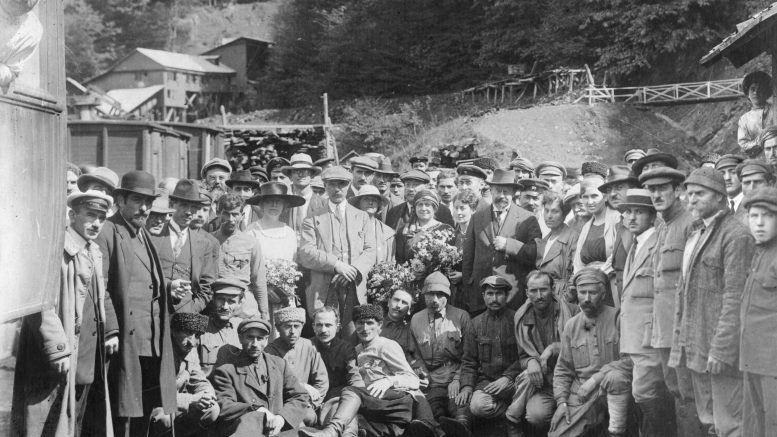 And the Georgians seek international recognition, using both traditional diplomacy (at the Paris peace conference) and the sympathy of the international socialist movement, whose leaders will visit the country in a high-level delegation in September 1920. Despite the fact that leaders of both Russia and Georgia are men and women who had been members of the same political party only a couple of years earlier, and both sides professed to be Marxists, the societies they were creating were radically different from each other. Even though the Bolshevik state was just a year old, the contours of the future Soviet totalitarian regime could already be seen: the labour camps, the secret police, the one-party state, the red terror. And though the Georgian republic would not last more than another 27 months, one can extrapolate its future character from what was being done in 1918. It would almost certainly have continued as a democratic society, respecting human rights and aspiring to social justice and greater equality for its citizens. Sadly, of the two experiments, it was the Bolshevik one that was allowed to continue, and the Communist dictatorship remained in power for another seven decades, causing untold human suffering and the deaths of millions of innocent – and I emphasize innocent – victims. All that remained of the Georgian Social Democrats and their very brief experiment is a memory – and proof that another kind of revolution is possible.